Preheat oven to 350° F. Mix beans, oil, applesauce, eggs, egg yolk, sugar, cocoa powder, and espresso powder in your food processor. Pulse for 1 minute, or until smooth. Place your chopped chocolate and butter in a small bowl and microwave for 1 minute, stirring halfway. Stir until the mixture is smooth. Set aside to cool for a few minutes. Add chocolate/butter mixture, vanilla extract, and salt to the food processor; pulse to blend. Pour batter into a large bowl and stir in the flour. Spread batter into a foil-lined 8x8" baking pan coated with nonstick cooking spray. Smooth the top and sprinkle evenly with the walnuts (if using). Truth is, they don't taste of black beans. The traditional pasty texture of beans disappears in the chocolate fudge, leaving behind only moisture and a pleasantly rich density. 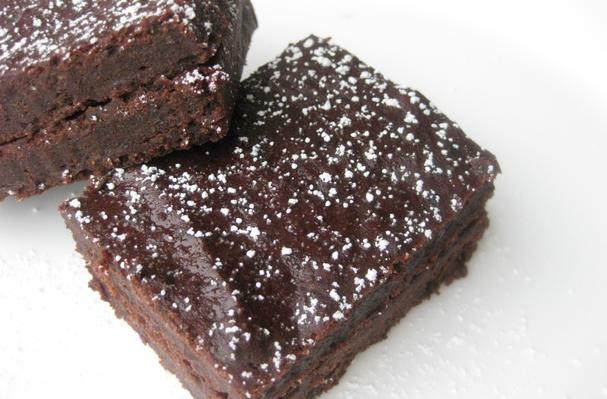 These brownies are thinner and much less cakey than your standard style. In fact, they barely rise. But they're quite scrumptious- sweet, ultra-moist, and fudge-like. A surprising satisfaction crossed my mind as I lifted my second out of the foil-lined pan. I smiled knowing that on top of the taste and texture, I had built a brownie that was lower in fat, higher in fiber, and richer with nutrients. Mmmm.